The Bureau for Paranormal Research and Defense faces its worst tragedy ever as the war against the plague of frogs reaches a devastating new level. Heralded by a bizarre villain from the B.P.R.D. 's past, an ancient monster-god marches across the American heartland portending an end to the reign of men, and leaving a permanent mark on the Bureau. 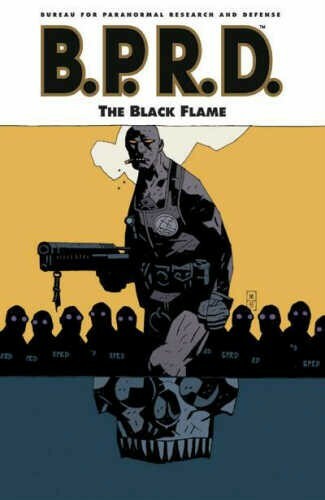 Hellboy-creator Mike Mignola continues his collaboration with artist Guy Davis and co-writer John Arcudi to unravel a tale that will leave the earth shaken and the B.P.R.D. shattered. This collection includes a sketchbook section chronicling Guy Davis's creation of the abominations unleashed in The Black Flame.